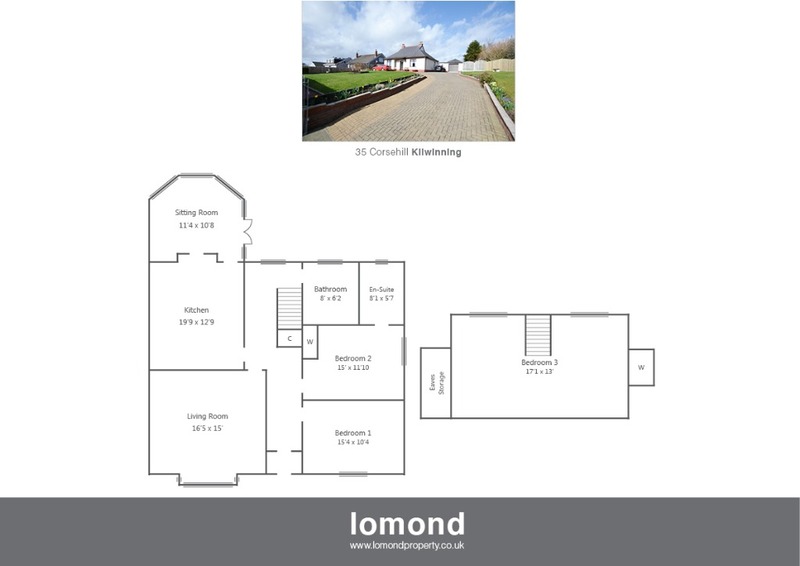 35 Corsehill is a simply stunning detached bungalow offering excellent family sized accommodation over two levels. The property is located on a large elevated plot, with generous garden grounds to the front and rear. The property boasts three double bedrooms, lounge, sitting room, large dining kitchen, with family bathroom, and en suite shower room. Externally the property has a multi purpose summer house, fire pit, log store, garage, and further storage shed to the rear. In summary the property layout extends to a welcoming entrance hallway with access to the lower level apartments. The front facing lounge is stylish with multi fuel burner and feature bay window. To the rear the stunning dining kitchen comes well stocked with floor and wall mounted units, integrated gas hob, oven, hood, fridge and freezer. Off the kitchen area, offering views of the garden is second siting room, again with multi fuel burner. There are two double bedrooms on the ground floor, one with en suite shower facilities. The stylish family bathroom completes the ground floor. The upper level houses a spacious double bedroom, complete with fitted wardrobes and a separate walk in cupboard/dressing room. Externally the property has generous wrap round gardens. To the front the off street parking is laid to mono bloc paving leading to the brick garage with newly fitted electric door. To the rear the garden comes with summer house, complete with bar area. There are a further two sitting areas one with fire pit, and log store to the side. Viewing is highly recommended to appreciate the property and its grounds. Corsehill is a pleasant residential area. Kilwinning town is close by and provides access to a range of amenities including supermarkets, bars, restaurants and town centre shopping. There are a number of local primary and secondary schools within the greater Kilwinning area.